One of the most important developments of the 20th century was the compressor-based refrigerator. No longer would we have to keep our food preserved through the usage of salt or icehouses. As the technology progressed, more silent and compact refrigerators were created until the mini fridge was invented, an appliance that could keep your food and drinks cold and take up no more than a few cubic feet of space. Today, there are scores of these types of refrigerators on the market, with some even working in specific niches such as wine cooling and beverage cooling. As you are looking for a great mini fridge, we’ve gone ahead and done the research for you and identified three of the best available today as well as an inexpensive pick that won’t break your wallet in half with the cost. Our Gold Pick comes to us from Guelph, Ontario-based Danby appliances. Originating in 1947, Danby serves a large share of the compact appliance market with products such as the compact refrigerator that serves as our winner appliance. As with all of our Gold Picks, this unit has received rave reviews from both consumers and critical groups, and has a rich set of features and a great looking aesthetic design that will fit well in any home. To begin, this mini fridge has a lot going for it in the design department. Danby crafted its door’s exterior out of steel that is unpainted and is resistant to smudges and fingerprints. The sides and the surface on top of the door are constructed of the same type of steel but are painted a reflective black. The resulting overall aesthetic looks great in any room’s décor from kitchen to den. Its measurements are 17.6 inches in depth, 18.7 inches in width, and 32.7 inches in total height. The fridge is also somewhat heavy to lug from room to room; in totality, it weighs almost 50 pounds. Internally, this mini fridge has some great features. Danby worked functionality into the design philosophy of this refrigerator’s interior. It is packed to the brim with concessions that will ensure that you will have space for all of the items you will need to refrigerate. Starting with the interior of the door, this area of the refrigerator employs a construction that is designed to ensure that your beverages have an easy to reach area to keep them cool. The first area that you might notice in this section is the wavy metal wired section along the inside edge. This area of the door, called the Canstor dispenser, is designed to allow you to stack soda and beer cans vertically. At the base of this dispenser is another metal section that is lipped; this area is designed to neatly dispense the cans from the bottom of the assembly. New cans are fed via gravity, so that a new can of soda is always within reach. Beside the Canstor dispenser is a section for two to three liter soda bottles. These bottles are kept in place via another metal wire and are given more than enough clearance to easily remove them from the door. Above this is a section for smaller bottles that are secured by a plastic bar. Finally, at the top of the door’s interior is a final section that you can use to store even more bottles or cartons. The overall inner section of this mini fridge’s door provides a great amount of storage without even considering the main interior section of the fridge. Its functional design really helps illustrate why this appliance is a Gold Pick. The main section of this fridge sports three surfaces for the storing of food or beverages. This includes the base of the fridge and two wire racks. The racks are removable, ensuring that you can clean them with soapy warm water with ease. Above these surfaces, this Danby unit has a full width freezer that is separate from the other parts of this fridge, so that you don’t have to worry about any food getting unintentionally frozen. From an energy efficiency and environmental front, you’ll be pleased to know that this is a very eco-friendly appliance. It’s fully Energy Star rated and uses a R600a refrigerant that is safe for the environment. With this mini fridge, you’re environmental footprint will be much smaller. When it comes to reviews on Amazon, there are several for this product. Out of the 522 that are on the site, 79 percent are positive with a four star or greater rating. Most reviewers say that they love the design and appreciate the interior space of this mini fridge. Danby also offers an 18 month warranty on this product. National appliance manufacturer Keystone Appliances is the manufacturer of our Silver Pick product. The first dual-doored unit on our list, this refrigerator has plenty of functionality to accompany its great looking design aesthetic. 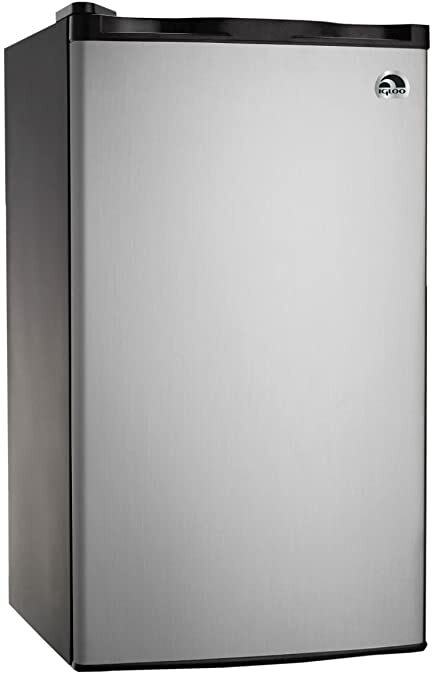 This is the perfect fridge to keep in a den or man cave, and it is very energy efficient as well. 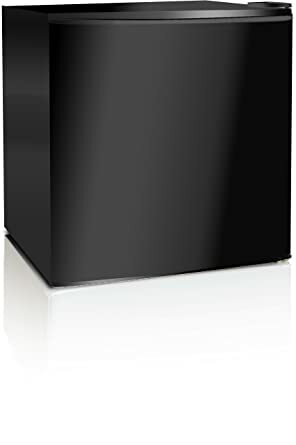 First off, the first thing that you’ll notice about this mini fridge is the fact that it is jet black in coloration. While it is comprised of metal, Keystone finished this refrigerator in a matte black coating that reduces its reflectiveness and helps the appliance blend into any décor seamlessly. As mentioned previously, this fridge sports two doors; one for the main refrigerator compartment and another for the large freezer area. As a general rule, mini fridges of this type balance the temperatures better than the majority of refrigerators with a single door form factor. When it comes to measurements, this fridge is 20 inches in width, 18.5 inches in depth, and 33.2 inches in height and weighs even more than our Gold Pick at 55.4 pounds. Internally, the main refrigerator area is smaller than the one featured in our Gold Pick fridge but you’ll have a few additional options to make up the difference. Firstly, there is a canned beverage storage section on the inside of the door that lets you stack your drinks vertically. While this might not have a dispenser section along the bottom, you actually would be pulling cans out of this wired area from the top. Positioned directly alongside this area is a space for larger beverage bottles. The main interior section of the primary compartment in this mini fridge is significantly different than the one found in the Gold Pick Danby model. To start, whereas the Danby model utilized wire racks for storage, this model makes use of the easier to clean glass style of shelving. Also, while there is less standard shelving in this smaller space, Keystone opted to include a crisper drawer in the bottom of this mini fridge. This will ensure that your stored veggies will stay fresher longer in this fridge. The freezer in this unit is an excellent unit, the controls are mechanically controlled and there is a manual defrost function. Keystone also included an extra bit of storage on the inside of the freezer’s door. This is perfect for freeze packs and even frozen candy bars or popsicles. On Amazon, this item is very well-received. 87 percent of the reviewing audience has granted this a positive rating in the four or five star level of quality. Users tend to favor this fridge as a great addition to a den or a college dorm room. Our Bronze Pick comes from electronic retail giant RCA. RCA has been manufacturing home appliance electronics for over a century now. With this much time spent developing products to make life easier, you’ll know that our Bronze Pick mini fridge will attain the same level of quality that RCA has come to be known for over the years. This Igloo fridge has a lot going for it, and for a relatively low price. The first thing that you might notice when observing this mini fridge is the fact that it’s a single door unit. Like our Gold Pick’s manufacturers, RCA has figured out a way to reduce the temperature leakage from the freezer in such a way that a two door setup is not explicitly required. The similarities in the two refrigerators don’t end here either; both of these mini fridges are metallic in color and have black trim and siding. The RCA unit however, comes in several additional colors, including blue, black, lime, white, red, orange, lime green, and even purple. These design options will help this mini fridge blend in well with any room you place it in. The measurements of this appliance are 18 inches wide, by 19 inches deep, by 32 inches height. The fridge is also semi-hefty at 47 pounds. The door has two grips on either side for easy opening and is fully reversible; a feature that adds to the versatility of the fridge. The interior of the door contains a can dispenser system that will allow you easy access to your beverages as well as a storage space for larger two to three liter bottles. Above these niches, you’ll find two separate storage areas that can hold anything from smaller bottles to a full carton of a dozen eggs (sideways). The main compartment of this mini fridge is something of a hybrid of the systems employed by our prior two picks. While it doesn’t incorporate a separate fruit and vegetable crisper, it does have glass shelves that are easily cleaned and adjustable. With the rack system, you can pick from seven different height positions for the shelving. The refrigerator section, as mentioned previously, bleeds little cold air into the main compartment. Its thermostat allows for temperature adjustment in the ranges of negative four degrees to zero degrees Celsius. 69 percent of 523 reviews for this mini fridge are at a positivity level that either warrants a four or five star rating. 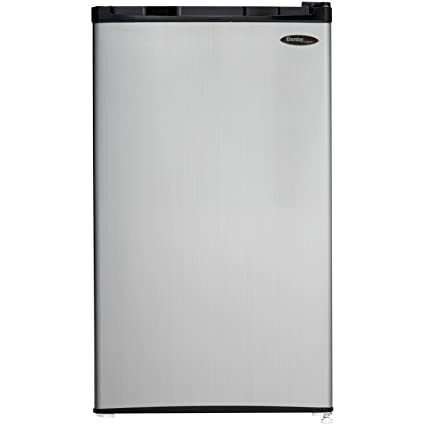 The general consensus of the five star level reviews indicates that this is a great fridge for just about any small area because of the reversibility of the main door. Consumers also like the fact that this fridge comes in so many vivid color combinations. For those who tend to ball on a budget, spending tons of money for compact refrigeration isn’t required. Midea, a Chinese appliance company, manufactured this squat cube-style refrigerator with a low price point and staunch feature set planted firmly into its design philosophy. This is the perfect style of mini fridge for under the desk at work of beside the couch at home. As mentioned above, this is a cube styled refrigerator. These types are very small and portable styles of mini fridges that you can take with you if you need to go camping or to a tailgate party. Its total measurements are an almost perfectly cubic 17.7 inches deep, 18.6 inches wide, and 19.4 inches high. This is also fairly easy to heft, weighing only about 35 pounds in totality. The whole fridge is coated in a matte black paint that protects the metal structure of the appliance. Very little of the edges are rounded on this fridge; a feature that enhances the cubic shape of the unit. Internally, despite the size of this cube, you can still fit quite a lot of food and beverages in this ballin’ on a budget pick. The inner door section, which is also reversible, has space for a full two liter soda along the inside and room for two small cans or bottles in the section immediately to the right. Each of these compartmentalized areas is protected by a single metal wire that keeps your drinks from falling to the floor when you open the door. Above these areas is one additional small compartment that you can store two or three canned beverages in; Midea included a bar in this section to protect against rollage. The main compartment of this mini fridge has two tiers of storage; one at the mid section of the fridge and another at the refrigerator’s base. The single rack is of a removable wire style and is relatively easy to pull out and clean. In the upper right side of the top section is the micro-freezer. While you don’t get a lot of real estate in this freezer area, you can certainly store a TV dinner or ice pack here. Unfortunately, despite its smaller size, this freezer does infringe on the top shelf’s space a bit. When looking for a new mini fridge, be aware that there are many available types for this style of appliance. What type of mini fridge you choose should greatly vary based on what your specific needs are. Here is a list of mini fridge types and what they are used for. • Beverage or Snack Fridge – These types of mini fridges typically utilize a thermoelectric system to keep beverages or snacks cool. Unfortunately, the level of coldness that these appliances produce isn’t really rated for keeping the majority of food items from perishing. Look into this style of fridge if you’re going to be purchasing a unit for a kid’s room or a den that’s far away from your kitchen; you’ll have access to your cool drinks in short order. • Cube Fridge – Out of all the mini fridge types, this is the most portable. These range in size greatly, but typically don’t come in sizes in excess of two cubic feet. From a weight standpoint, the majority of these refrigerators weigh around 20 pounds or less, so you can take them to an event, plug them in, and keep your food cold. Unfortunately, these aren’t the most energy efficient devices on the planet, so take the portability with a grain of salt. Our ballin’ pick is one of these types of refrigerators. • Mid Sized Mini – This is the type that we’ve featured as the gold through bronze picks on our list, and on average, you’ll find a lot of these types will have similar dimensions; around 3.1 cubic feet of space. This is the perfect style of mini-fridge for a workspace; you can store your lunch and snacks in here with little fuss. It’s also great for students, as you’ll get tons of leftover storage area in this style of fridge, and the top surface holds the perfect space for a microwave. • Counter Style – This style of mini fridge is designed to be nestled into a counter space, this type is typically used for the storage of food preparation items that the chef wants to keep closer to the cooking area. These are typically sized between 3.5 to 4.5 cubic feet, and can come in single or double door varieties. • Wine Fridge – Primarily designed to keep wines at their perfect serving temperatures, you don’t want to store food in these styles of mini-fridges. These can have separate compartments that are able to store different vintages at varying temperatures. The intended purpose of you future wine fridge will greatly affect the type of refrigerator that you should buy. Simply based on the list of types that we’ve listed above, you should understand that the type of fridge you purchase should be greatly affected by the intended purpose it will fill. Are you looking to keep your beers warm? Then try a thermoelectric beverage fridge. Looking to go camping and need a place to store eggs for the morning? 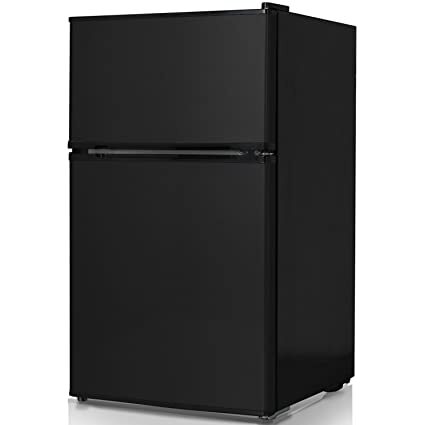 Then maybe a cube style will be up your alley (assuming you can find a current), Looking for a fridge that will handle some of your main refrigerator’s overflow? Then think about a counter style fridge to enhance your kitchen’s storage capacity. When looking for one of these types of refrigerators, be sure to consider what you’ll be using it for and you won’t be able to go wrong. This is another factor that can vary by the type of fridge you choose. As stated before different fridge types have different sizes, and the size you choose should reflect how you’ll be using your new mini fridge. If you’ll be storing beverages, you don’t need a larger model, a smaller cube fridge or thermoelectric styled beverage fridge will do well to keep your drinks adequately cool. Also, have an idea of the type of space you’ll be placing your new mini fridge in. You don’t want to purchase one of these, and then find out that it’s too large for your room. For the most part, these come in two varieties metal and glass. Here’s the difference between the two types. • Metal – The traditional refrigerator type. These are made of metal and are typically permanently affixed to the interior of your mini fridge. To clean these you might have to remove all of your food items to really get inside the surfaces of the wire shelves. • Glass – These are typically removable and are usually much easier to clean. Any spills that happen on glass shelving can be wiped away relatively effortlessly with a damp rag or sponge. These can crack, but are typically very sturdy and will last you for years. As a rule, glass tends to win out when it comes to shelf type because of its ease of cleaning and attractiveness, but that doesn’t mean that the traditional wire metal rack is a bad choice either. When it comes to shelf type in your new mini fridge, take a look at the shelving system that’s available in your new buy and make your decision based on what works best for you. Many of the types of mini fridge on the market today employ a single or double door system for food storage. Those that utilize a double door system usually have one compartment for frozen items and one compartment that will chill food and drinks below the freezing level. As a rule, double doors are better if you intend to use your freezer, as single door variants tend to make the whole fridge much cooler; you might even find food that you intended to merely chill, to be frozen in single door models that have a freezer. On the other hand, double door models with their dual cooling systems tend to be a little less energy efficient than single door models. Making a trip to the kitchen is typically not a massive chore, but having the ability to have a refrigerator at hand is one of the many conveniences that today’s modern world has to offer. With so many people seeking a way to have snacks or beverages closer at hand, or seeking a solution for the storage of food in their kids’ musty dorm rooms, there’s no wonder that there are myriads of these types of mini fridges on the market today. Hopefully, our list of great mini fridge models and our pre-purchase considerations will help you arrive at a decision when it comes to portable and space-saving refrigeration. Remember, you have a lot of options, so take your time before making an informed decision.